The Hair Stylist HipNotions was originally designed for a fashion and wedding hair stylist professional in LA. 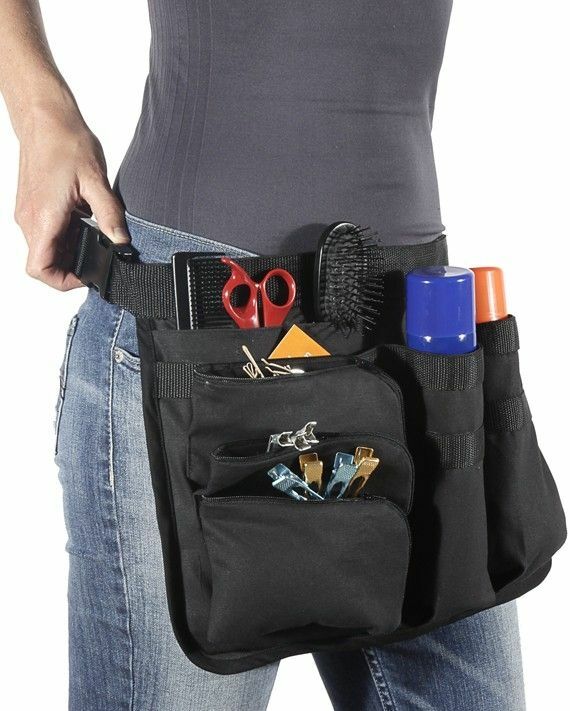 She had searched shops and internet before she put a call out for someone to design a tool belt that fit her needs. She sent photos of the items she needed to carry on location away from the saloon. This she did after a fashion shoot on the beach where her items where laying in a bag or next to it in the rocks and sand. A prototype was made and some test driving was done. She was hooked and could not live without it. We had to wait on making the final adjustments, when there was some down time in her schedule. She calls it her "Jamie Belt" after her namesake. Hair Stylist number two wrote- " WOW! It is impeccably made, you are a true perfectionist! I can't wait to use it! It is perfect in every way." There are actually ten pockets in this 13"x16" apron with a 1.5" web belt adjustable up to 45" with a side release snap. Three lined zipper pouches with vents to hold pins for easy reaching. 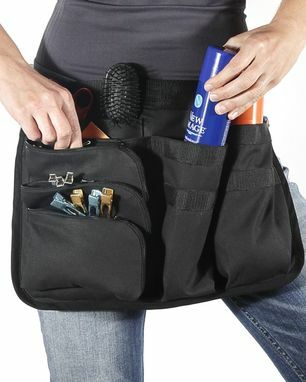 Two large pockets re-enforced with 1" webbing to hold the pockets open for hairspray or dropping clips or to hold a hair dryer. Five other flat pockets for combs, scissors, brushes, business cards and other personal items.